Everything you ever wanted to know about Spartamets & Snorfiets but were afraid to ask because you thought it would be in Dutch. A Snorfiets is the Dutch term for a bicycle with a small engine. The small engine is called a Hulpmotor, because it helps in the wind and going up hills. The term snorfiets actually translates to moustache bike, a snor being a moustache in Dutch. However the Dutch call it a snorfiets because of the way that it sounds; as if someone is snoring. Larger mopeds are called Brommers, but with English so prevalent in the Netherlands, most people refer to them as scooters or mopeds. A Spartamet is the brand name for the bikes made by the Dutch bike company Sparta. Sparta made a deal with German company Sachs to purchase small 30cc Sachs 2 stroke engines for the purpose of attaching them to a Sparta made bicycle. The result, the Spartamet, nicknamed a snorfiets in Dutch. Sparta produced Spartamets from 1985-1999. Are all Spartamets are Snorfiets? Yes, with an exception. All classic Spartamets have the small engine and make the snoring sound, hence they are a snorfiets. 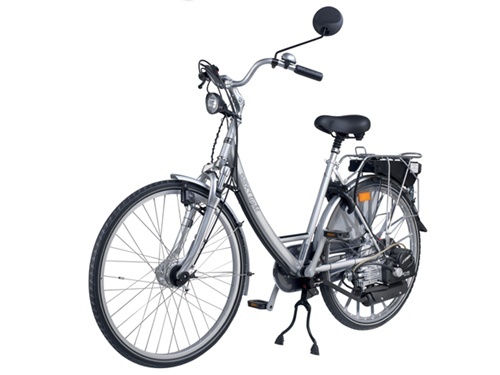 The exception; Sparta reintroduced the Spartamet name on an electric bicycle in 2013 so now there are electric Spartamets. So then all Snorfiets are Spartamets? No. Once Spartamets became popular and were selling 20,000 units a year, other bike companies made deals with Sachs to get the engine. In Germany, the company Hercules made a version called the Saxonette which was wildly popular in Germany. In Austria, motorcycle manufacturer KTM made some versions of the Spartamet. Are all Spartmets & Saxonettes snorfiets? In Dutch, yes. In German, they are all called Saxonettes after the brand name. In Holland, they are called Spartamets, or the nickname, snorfiets. The easiest way to think of it is they are all bicycles with help motors. In Dutch that is Fietsen met Hulpmotor, Spartamet or snorfiets. In German, it is Fahrrad mit Hilfmotor or Saxonette. Were there any other versions of snorfiets or Spartamets? Of course. Once the Dutch got a hold of the engines, they started to put them on other types of bikes. Sparta made a tandem version, the Spartamet Tandem, which is nicknamed a Tandemet. For elderly there are Driewieler, three wheeler, snorfiets. The classic Dutch bikes with the large box on front for cargo or children, called a Bakfiets, have also been outfitted with snorfiets engines to help push the kids around. There are even Tandem Driewieler Spartamets, so two people on three wheels. Soon the manufacturers took notice and started producing other types of bikes with helping engines on them while cagey Dutch tinkerers built their own wild inventions. What are the Dutch laws concerning Snorfiets? The Snorfiets/Spartamets are limited to 25 km/h maximum speed. They must have a bell or horn and working headlight and tailight at night. No helmet is required to ride. What are the Snorfiets & Spartamet rules of the road? As 25 km/h vehicles, spartamets may use any and all bicycle paths. When there is no bike path, and signage is not forbidding bicycles or scooters, using the side of the road is permitted. Normally another bike path will begin within a few hundred meters, but there are places where you must use the road and share it with cars. You should signal right and left turns by simply pointing the direction you plan on turning with an outstretched arm before reaching the intersection. Use your bell to warn others of overtaking from behind when necessary. Pay attention to all road crossing signals. Red means stop, green means go. Most crossing have their own bike signal and symbols as well as a button to push. Share the road. You will be riding with faster mopeds, slower bikes, and people and children walking. ALWAYS give pedestrians the right of way and let them cross. Most times cars will do the same for bikes but DON’T ASSUME they will stop. 25 km/h vehicles ALWAYS have right of way vs 45 km/h vehicles. These are the faster mopeds and the very small cars limited to that speed. 45 km/h vehicles ALWAYS have right of way vs cars & trucks. In modern towns like Almere, there are dedicated Bus lanes. These roads are exclusively for buses and emergency vehicles. When bike paths cross bus lanes, there will be a signal and an audible alarm warning a bus is coming. The buses DO NOT STOP. If you see flashing red lights or here an alarm or railroad crossing sound, STOP, LOOK, LISTEN. There is a bus or emergency vehicle coming at high speed.